Next in my series of book reviews is a review of not one, not two, but rather, three recipe books. These three books fall into the “not sure these were worth the money” category. I purchased all three of these while in my “intermediary brewer” stage, when I brewed using a mix of malt extract, adjunct grains and hops. Firstly, while these recipes resemble the beers they claim to clone, they do not clone the beers. The recipes are close enough that you have an idea what you’re going to make, but you’d never mistake a brew from this book for the real thing. Moreover, the organization of the book is poor – beers are organized by country of origin, rather than style. But the biggest drawback is the all-grain versions of the brews. In place of real all-grain recipes, this book simply replaces malt extract with the appropriate amount of pale malt and then gives a generic (and bad) mash schedule. Everything that all-grain brewing offers – control over mash conditions and thus the body & maltyness of the resulting beer – is ignored in the recipes. This book offers little aside from recipes; a bit of brewing advice, and a few data tables round out this book. 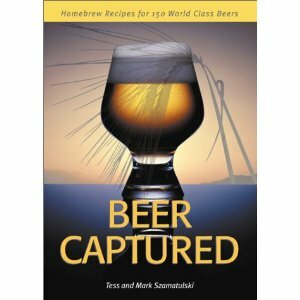 This is the follow-up book to Clone Brews, adding an additional 150 clone recipes to those found in Clone Brews. It follows the same recipe template as Clone Brews, although the setup is more visually appealing. 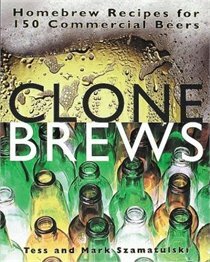 As with clone brews, the recipes are close to, but not exact copies of, the commercial brews which are “cloned”. Some of the defects in Clone Brews have been corrected in this book – recipes are organized by style rather than country of origin. However, the key weaknesses remain – notably, the all-grain “recipes” are not true all-grain versions of the beers, but rather the intermediary brews with pale malt and a generic mash schedule substituted in for the malt extract. If I were going to purchase only one of the Szamatulski’s books, it would be this one. I purchased this book soon after starting homebrewing, way back in 1996. Unlike clonebrews, most of these recipes are homebrew recipes rather than clones. All of these brews are intermediary brews – i.e. extract + specialty grains + hops, with no all-grain equivalents given. Several recipes are given for each major brewing style. As intermediary recipes go, these ones are rather good. But the age of the book means that the full cohort of ingredients and yeasts available to modern brewers are not used in the recipes. Likewise, the lack of all-grain recipes is bothersome, especially when making the transition to all-grain. Lastly, many of the recipes have a “homebrewed” taste to them, again, because this book’s recipes were built around the limited ingredient options available back in the mid-1990’s. 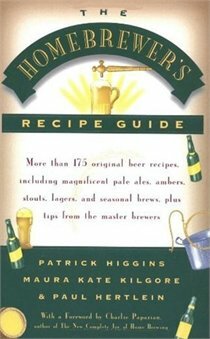 Aside from recipes, this books offers a handful of 1-page “Brewers Hints” that any brewer reading the book likely already knows. My favorite part of the book has little to do with beer – there are a number of excellent (and often humorous beer-related quotations scattered throughout the book. But, by far the best part of the book is the last handful of pages. These are food recipes using beer, and these recipes are excellent. The bratworst and rib recipes are standards in my home; the game hens and Erin go Bragh pies are specialty dishes we make a point of cooking at least once a year.